Accessories and jewelry, my forte. My jewelry collection over the years has grown rather large and instead of letting everything form a big heap of a mess, I like to keep everything neat and organized. Awhile ago I blogged about how I organize everything in an unconventional, yet pretty way. Today I'd like to share how I keep everything clean and looking its best. Here are my tips on how to take care of your jewelry. -Store it. When everything has its place, it is easier for you to find what you need at a glance. 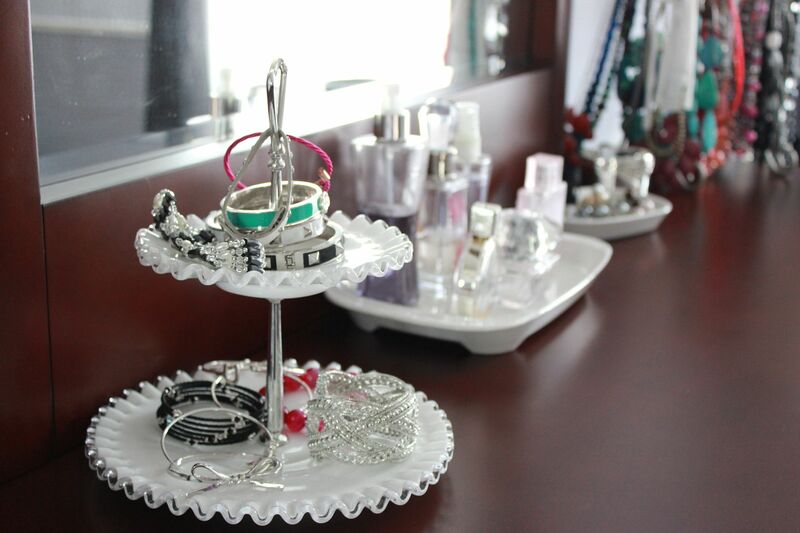 I hang my statement necklaces on a fingertip towel holder, display my statement bracelets on a cake stand and then store my more delicate pieces in a jewelry stacker inside my dresser. -Keep everything dry. Don't allow liquids to come into contact with your jewelry. By following the storage tip, you can save your jewelry from accidentally getting spilled on. Also, take all of your jewelry off before you shower or swim. Keeping everything dry will keep your jewels sparkling like they are supposed to. And you won't have to worry about losing anything either. -Put your jewelry on last. If you are like me and wear makeup, perfume or hairspray (I wear a lot of hairspray) you should always leave your jewelry off until you are finished. Particles from your makeup can make your jewelry dirty and the perfume or hairspray might cause discoloration. Get ready first, then put on your jewelry. For me, its the last thing I do before I leave the house. -Use a travel bag. Instead of just throwing my jewelry and accessories in plastic bag, I like to use a divided jewelry organizer for my things when I travel. This helps keep my delicate necklaces from getting tangled and also keeps me organized: the earrings, rings, bracelets and necklaces are all grouped together so I can easily find them. It makes unpacking a breeze too!